It's the weekend! Are you in the mood to try something with a caramel flavour, and that too Desi? 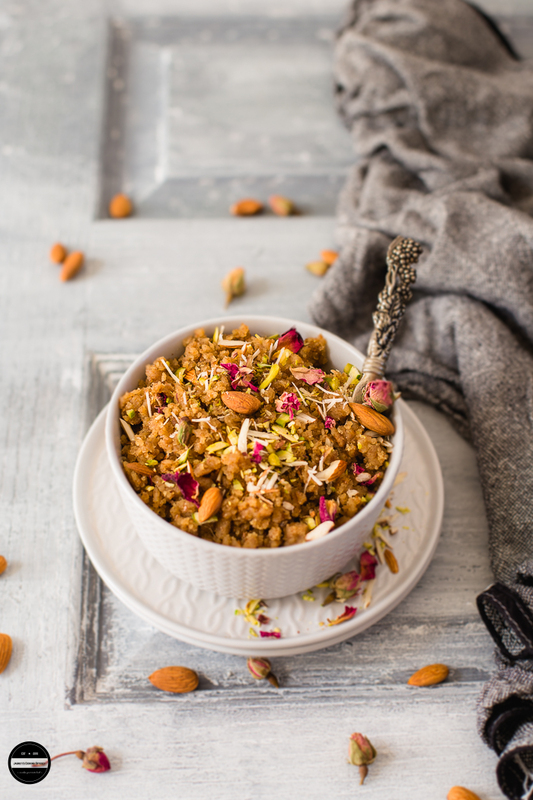 Try this Makhandi Halwa! A smooth, satisfying and delicious halwa is uncomplicated to make but hits the sweet spot every time. 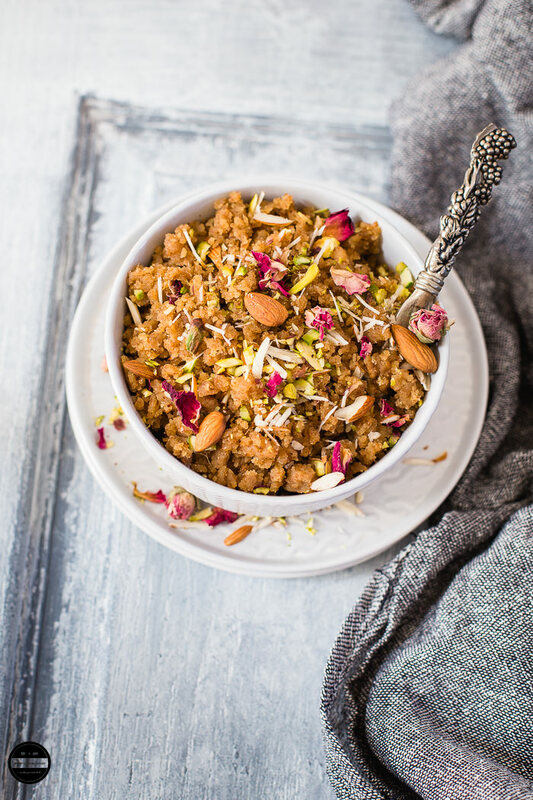 This hugely popular recipe of this halwa hails from North West of India Punjab, now it's Pakistan. This unique tasting halwa although prepared with the same ingredients as normal sooji ka halwa, this halwa has it's own method. It shows how the method changes its tastes and textures. A few weeks back on Facebook in one particular group few ladies were chatting about particular this halwa, the name itself drew my attention to that particular post and back of my mind I was thinking I've heard about this dish but couldn't recall it that time, however I found their chat very interesting, how those girls were missing their mum's Makhandi halwa, some of them said they can't make it and want recipe etc etc..so quickly I checked on google what is this halwa all about? When I read the recipe of this halwa, suddenly a rush of memories was in front of my eyes. Almost 26 years ago, I did hear about this recipe, one of my Pakistani college friends told me about this Halwa. We decided to bring one dish for lunch, I took Muthia many brought some other dishes and Pakistani lady brought Shir Khurma, ( Vermicelli Pudding )which was phenomenal, and that time she told me that next time she will bring 'Makhandi Halwa'. I never got to try the halwa as I left that college and then also completely forgot about this halwa. When I saw the recipe for this halwa, literally my mouth was watering and made my mind up to prepare this Halwa for hubby's birthday along with Panjabi Chole Bhathure, a combination he loves to devour. The halwa turned out soooo good, but was so simple to make. It was scrumptious, without needing caramel, this halwa had caramel flavour which we loved the most. You won't need any fancy ingredients for this recipe or much skills, just follow the recipe to T and you'll have this incredibly irresistible dessert to devour on any special occasion. This halwa best serve while it's warm. Warm halwa oozes lots of ghee. I took pictures while Halwa was very cold. I have used Rose petals for only photographic purpose. Makhandi Halwa, with a unique caramel taste and delightful dessert. In a bowl add semolina and milk, mix together and leave it aside for about two hours. Heat ghee in a nonstick kadai or heavy bottom pan, and add sugar and cardamom powder.Mix it very slowly, and let the sugar melt.Once the sugar melted you'll see caramel brown colour syrup, don't let the sugar burn otherwise halwa will taste bitter.Now carefully add the semolina mixture, and keep mixing the mixture. 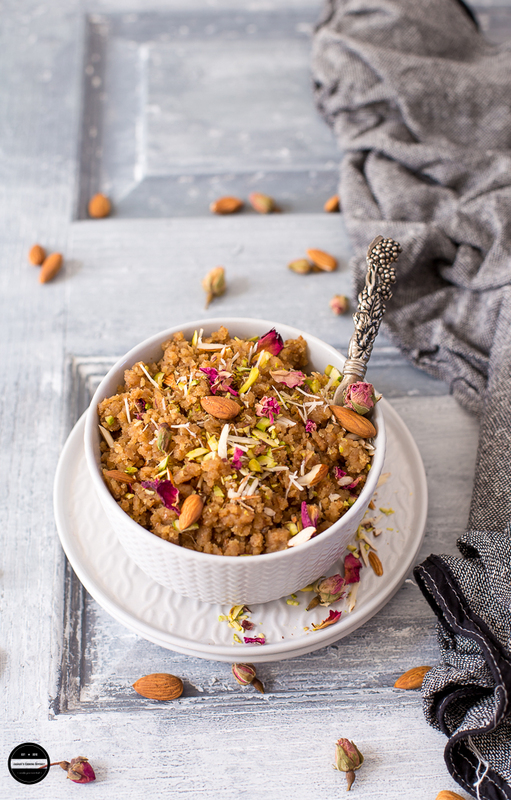 Cook this halwa mixture around 30-35 minutes on a low heat. As the halwa cooks it will slowly go brown and harder. These are the signs you are cooking the halwa in the correct method. The ghee will separate from the halwa mixture, if you want, you can take out that ghee, I left it.Once the halwa is ready, turn off the heat.Serve in a serving bowl and garnish it with almond and pistachio slivers.Enjoy warm. 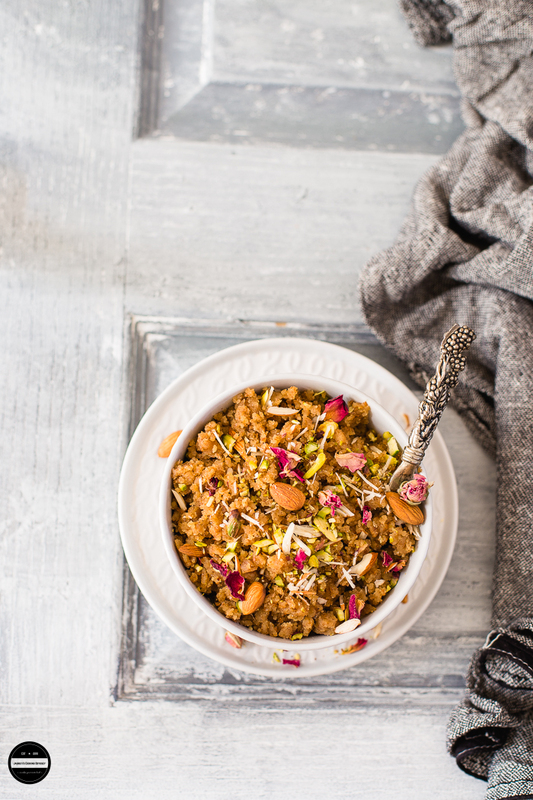 The name o fthe halwa sure compelled me tro check out this recipe right away Jagruti! I cannot wait to make it. I love caramel flavor. Thanks Sandhya! It is a unique name of the recipe isn't it? Let me know how you like it. I love your pictures! so captivating!!!!! Thank you Freda! Couldn't agree more :) This halwa was so delicious. 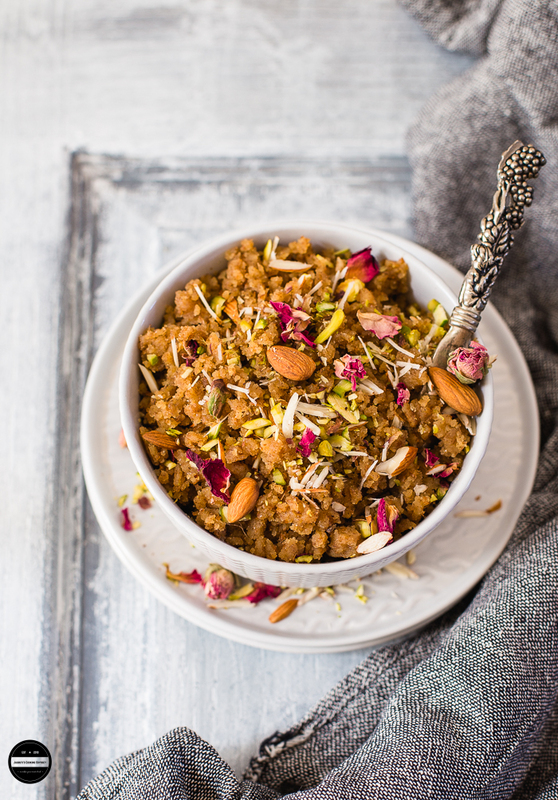 Astonishing clicks, this Makhandi halwa is simply irresistible and absolutely fabulous. Wish i get this incredible halwa from you Jags, that caramel flavor is amazing. Halwa sounds so interesting and delicious, I love to try it soon,I love the caramel flavor into this halwa..pass this full bowl over here. Thanks Jolly! Also so easy to make it too. Hahahha..well now you have the name :) Thanks for your words. Lovely interesting flavours in the halwa, have never tried it but yummy recipe and the tempting clicks are telling me to try the recipe soon . Never heard the name makhandi halwa. Awesome click. Your pictures tempted me to try it. Thanks for the recipe. Who can resist anything with caramel; I certainly cannot! And to add this flavour to our traditional Sheera will give me just the best kind of dessert. This is pure indulgence! 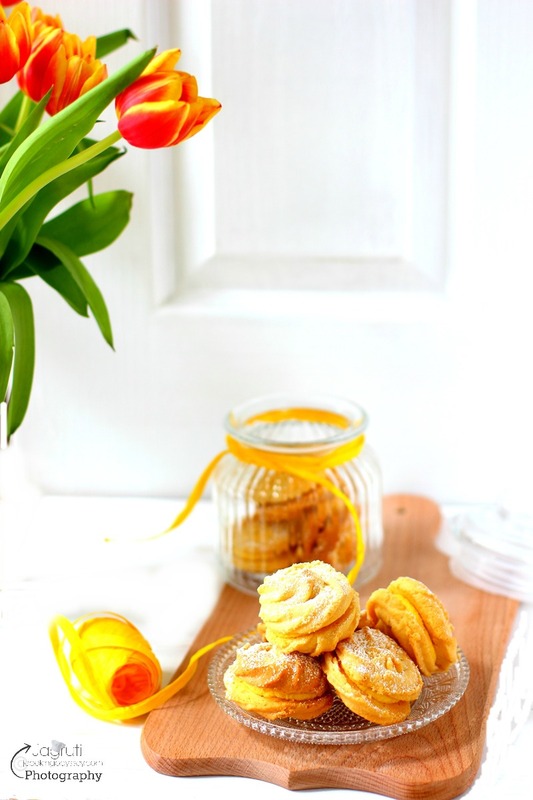 Though I only make halwas in winter but your gorgeous clicks are tempting me to try this recipe soon. Most probably in Ramadan. Thanks Maria! Absolutely :) Please do let me know how your family like it. This is new to me and looks so yumm. Do pass on some Jagruti. Lovely clicks. That is such an interesting way to cook semolina halwa in caramel sauce. Love the beautiful pictures and the wonderful composition. This is truly divine ! 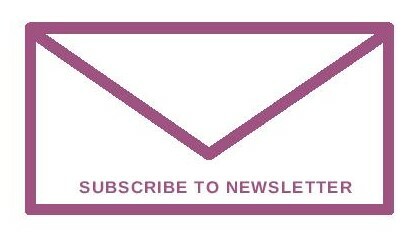 I am in love with your clicks ! I am loving everything about this post. Starting from beautiful pictures to yummy looking halwa. This is totally new recipe for me.The name sounds interesting. Bookmarking this recipe Jagruti. Thanks for sharing such a wonderful and fantastic recipe. Amazing recipe. Name itself so unique and eye-catching. Would definitely love to taste and try..
That's a delicious looking halwa, not heard of it. Would love to try it out. Caramel flavor is what has caught my attention.